David's recording career began in 1985 with Buddy De Franco and Martin Taylor and his first solo album was released in '88 in association with producer Elliot Meadow who oversaw the next nine years of recording for Linn Records followed by Candid Records. Once again, in 1997, David Newton and Alan Barnes teamed up and together with Concorde Label agent Barry Hatcher, made four CDs for that label. By 2003, Newton had learned a great deal of the ways a record company operated and he set up a business partnership with former pupil Mike Daymond and they established "Brightnewday Records" initially as a vehicle for Newton's own music but with an eye to opening up the catalogue to other artists later on. In the first five years of the nineties, Newton's reputation as an exquisite accompanist for a singer, spread rather rapidly and by '95 he was regularly working with Carol Kidd, Marion Montgomery, Tina May, Annie Ross, Claire Martin and of course Stacey Kent, with whom he spent the next ten years recording and travelling all over the world. While all this was going on, Newton was composing music which he would record on his own CDs as well as writing specifically for Martin Taylor, Alan Barnes, Tina May or Claire Martin and Newton's music can now be heard on many television productions, especially in the United States where over twenty TV movies benefit from Newton's haunting themes. In 2003, after a twenty year gap, David Newton was reunited with playwright Alan Ayckbourn having been involved with eight world premiers in Scarborough and London back in the early eighties, and he was asked to write the music for two new productions, "Sugar Daddies" and "Drowning on Dry Land". Currently, with the release of a new CD called "Portrait of a Woman" on the "Brightnewday" label, David Newton is relishing the musical freedom of his Trio and the special sound it makes whilst working on two other new recording projects, as an arranger and a composer. 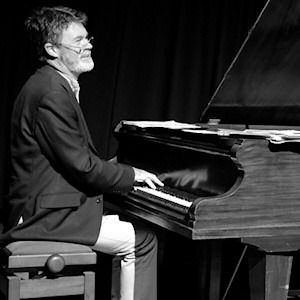 David Newton was voted best Jazz Pianist in the British Jazz Awards 2012 for the twelfth time and was made a Fellow of Leeds College of Music in 2003.